Today, about one in three kids in America are overweight or obese, nearly triple the rate in 1963. With good reason, childhood obesity is now the No. 1 health concern among parents and physicians in the United States, topping drug abuse and smoking. Among children today, obesity is causing a broad range of health problems that previously weren’t seen until adulthood and leading to shorter life spans. There are also psychological effects: Obese children are more prone to low self-esteem, negative body image and depression. As our culture becomes more sedentary and our diet becomes more loaded with sugars, fats and processed foods, children need strong guidance and role models by their parents, schools and community. The habits and priorities that a child learns in their early years will go with them throughout their adult life. 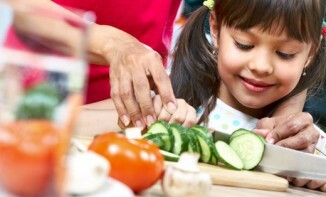 Healthy eating and active living can stabilize children’s energy, sharpen their minds, and even out their moods- giving them the start they need for the rest of their lives. Thus, it is essential that children are taught the lessons of daily fitness and nutrition. 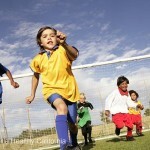 Children and adolescents should do 60 minutes (1 hour) or more of physical activity daily. They should combine the different kinds of exercise (aerobic, muscle strengthening and bone strengthening) to total 60 minutes each day. For example, children could do 35 minutes of running around a playground with a ball/ swimming, 10 minutes of monkey bars/ push-ups, and 15 minutes of jumping rope/ bicycling to reach 60 minutes. 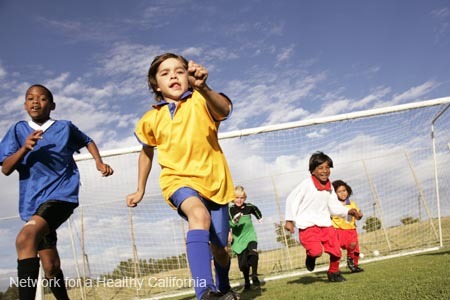 Visit here to get more tips on how to get your kids active. Too much TV results in less play time and less physical activity. Children who watch higher levels of TV often perform more poorly in school. Kids who view violent acts are more likely to show aggressive behavior and also to fear that the world is scary and that something bad will happen to them. TV characters often depict risky and unhealthy behaviors. Read more about the effect of TV on a child’s health on our Screen Time and Children’s Health page. Getting active outside helps to improve a child’s coordination, balance, and agility. Keep kids healthy mentally and physically by making time for play each day. By enjoying nearby parks, trails and waters, children and families will develop a more active lifestyle- and reap the benefits. Read more on our Connect with Nature page. As active parents, we often want to give our children what is easy, quick and we know will please. This does not always promote good health choices. During a child’s first 18 years, children are building their foundation for a healthy lifetime. For example, the calcium consumed in the early years is the storehouse for the latter years bone health. 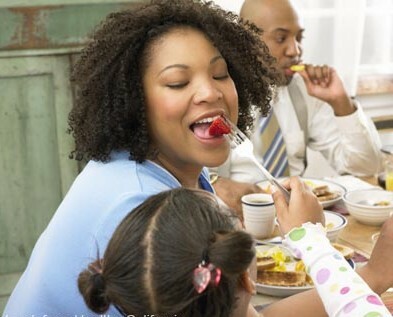 Here are some tips for increasing healthy eating in your home. Start with small servings. It is better to offer more than push a child to eat too much. Read about appropriate portions sizes at the American Academy of Pediatrics Child Serving Sizes. One of the biggest challenges for parents is to limit the amount of sugar and salt in their children’s diets. The American Heart Association recommends that sugar intake for children is limited to 3 teaspoons (12 grams) a day. Cutting back on candy and cookies is only part of the solution. Large amounts of added sugar can also be hidden in foods such as bread, canned soups and vegetables, frozen dinners, ketchup, and fast food. Read more on our Sugar and Kid’s Health page.